Home » » Abia Governor Kneels Down As Pastors Pray For Him To Win 2nd Term Election. Abia Governor Kneels Down As Pastors Pray For Him To Win 2nd Term Election. 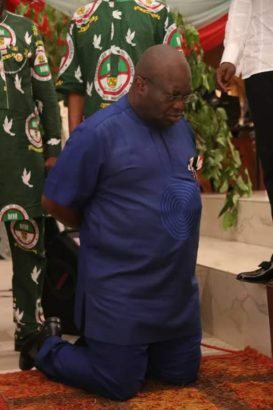 At least, five pastors have prayed for Okezie Ikpeazu, current Governor of Abia state who knelt down at an Assemblies of God church branch in Abia state to receive blessings for a second term. Members of Assemblies of God Church, Ukaegbu road Aba, prayed for the resounding success of Governor Okezie Ikpeazu in 2019 election and called on God to disgrace his opponents. Speaking the district superintendent of the church, Rev Emma Sylva, PhD, who led the prayer said: “Governor Ikpeazu fixed our Ukaegbu road among the very first within 100 days of his administration and we gave him the award of “Nehemiah”. 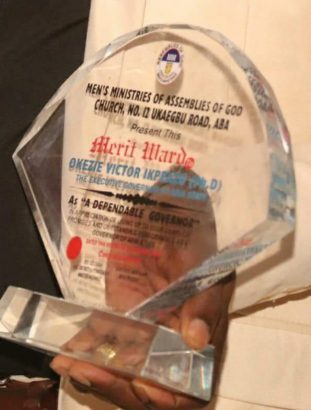 The governor was later honoured by the church’s Men’s ministry with the award of “Dependable Governor” and called on all their members to support the re-election bid of the Governor. In his response, Governor Ikpeazu thanked the church for supporting his administration with prayers and promised not to be distracted in his quest to renew and add to the road infrastructure stock of the state. “We are certainly not where we were in 2015, in terms of road infrastructure but we are aware of the need to do more than we have done because of the need to further improve our road infrastructure.